So this is the book that my friend Liz Steel has been secretly working on since last year. How time flies and the book was finally out in October 2016. There are two books in the 5-Minute Sketching series. One's on architecture (this book), and the other book on drawing people, authored by Pete Scully. Note that there are different publishers for the book, so the cover might look different, and so is the retail price. Mine's published by Apple Press. I got it from Book Depository where it's selling it at the lowest price. 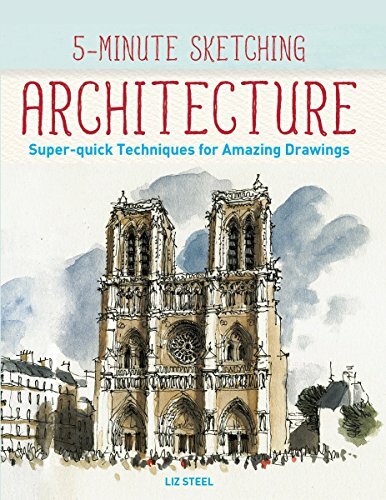 This 128-page book is a collection of brief tips on sketching quickly. There are only 4 chapters and each chapter has several topics, and each topic features 5 related tips. Liz shares many useful techniques, such as how you can measure angles and proportions, what to focus on, and also gives ideas of things to draw. Some of the featured examples are from her while others are contributed by other sketchers. It's a book that you don't have to read in sequence, and one that you can easily refer back to for inspiration.